Whether throwing a spectacular superyacht party or hosting a getaway, the key to success lies in the design details, says Risa Merl... Raise the bar A superyacht bar should be as practical as it is beautiful.“Our favourite bar set at the moment is the Robbe & Berking Martelé,” says Elizabeth Caddick of Glancy Fawcett. The Martelé bar collection (above) is available in silver, silver plate or stainless steel. Need extra space? The Martelé bar trunk can transform any corner of the boat into a stylish, vintage pop-up bar. For storing drinks, glasses and flatware, Glyn Peter Machin has created the Serengeti drinks cabinet, with hand-painted doors trimmed in 24kt gold, wenge and custom glass. A superyacht bar should be as practical as it is beautiful.“Our favourite bar set at the moment is the Robbe & Berking Martelé,” says Elizabeth Caddick of Glancy Fawcett. The Martelé bar collection (above) is available in silver, silver plate or stainless steel. Need extra space? The Martelé bar trunk can transform any corner of the boat into a stylish, vintage pop-up bar. For storing drinks, glasses and flatware, Glyn Peter Machin has created the Serengeti drinks cabinet, with hand-painted doors trimmed in 24kt gold, wenge and custom glass. “Stock the same crystal across all bars on board so that when you host a party people on different decks have the same glasses,” advises Caddick. “Champagne flutes in a selection of colours are always fun.” Moser’s new collection, A Tale of Colours (above), speaks to the trend towards colourful crystal. “By using different kinds of decoration such as cuttings, coloured glass gets a very special optic effect,” says Lukas Jaburek, the company’s art director. 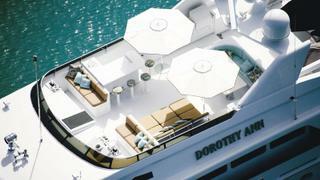 Moser can design handmade, limited collections of glassware for yachts. Glassware should complement the taste of the drinks, too. 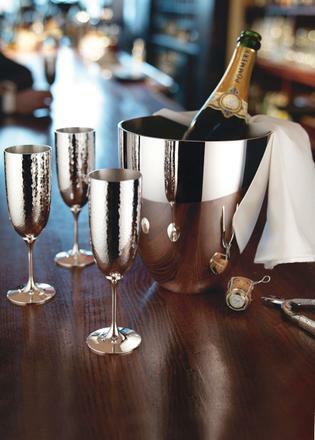 Puiforcat’s sterling silver champagne tumblers are designed to enhance the sparkling effect of champagne. “The metallic tumbler accentuates the chilled nature and provides a different way to taste champagne and sparkling wines,” says Puiforcat’s Amelie de Cagny. 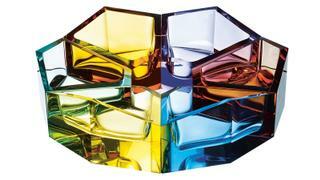 Moser’s new collection, A Tale of Colours (above), speaks to the trend towards colourful crystal. “By using different kinds of decoration such as cuttings, coloured glass gets a very special optic effect,” says Lukas Jaburek, the company’s art director. Moser can design handmade, limited collections of glassware for yachts. Glassware should complement the taste of the drinks, too. Puiforcat’s sterling silver champagne tumblers are designed to enhance the sparkling effect of champagne. “The metallic tumbler accentuates the chilled nature and provides a different way to taste champagne and sparkling wines,” says Puiforcat’s Amelie de Cagny. “When everyone stops swimming and sunning, the main saloon becomes the centre of life,” says art dealer Adrian Sassoon. “Everything should be a degree finer – the place where you can begin to introduce more formal art pieces.” Sassoon recommends the Dual Rivulet Bowl (above) by famed Japan silversmith Hiroshi Suzuki, who masterfully employs the traditional technique of hand-raising sheets of metal to create beautiful vessels. Collected by admirers of antiques and contemporary art alike, the bowl makes a powerful centrepiece for a saloon coffee table or credenza. 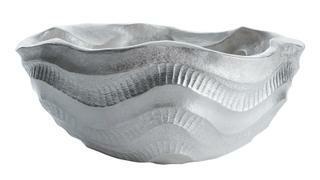 Sassoon recommends the Dual Rivulet Bowl (above) by famed Japan silversmith Hiroshi Suzuki, who masterfully employs the traditional technique of hand-raising sheets of metal to create beautiful vessels. Collected by admirers of antiques and contemporary art alike, the bowl makes a powerful centrepiece for a saloon coffee table or credenza. Co-ordinating tableware and linens in a cohesive theme – or to complement the yacht’s décor – will bring a table to life. 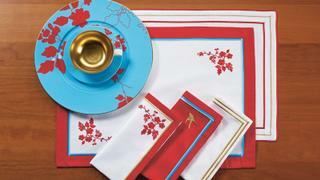 “For breakfast, we recommend 100 per cent pure linen,” says Ruth Douglas, of Heirlooms, “with coloured borders, piping or embroidery to reflect the tableware design, which adds elegance and vibrancy to al fresco dining.” Heirlooms’ Garden Rosa collection (above) delivers a vivid combination of turquoise, pale blue, and gold trim. End the meal on the right note. “A carafe or teapot are essential,” says Vanessa Sitbon, of Haviland. Comprising two tea cups, a teapot and a tray, the Japanese inspired Cérémonie du Thé set (above) is a masterpiece of porcelain craftsmanship. Your favourite artwork will set the theme for the main saloon and draw the eye. “The central, core theme of any artwork on board would be on the focal wall in the saloon, and this should be a special piece, one that the owner would take with them one day when they leave the yacht,” says Sassoon. 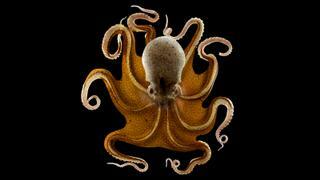 One of his favourites (above) is Leopold and Rudolf Blaschka, Octopus vulgaris, 2013 (© Guido Mocafico, courtesy Hamiltons Gallery, London). Steve Keeling, director of DKT Artworks, points out that there isn’t always wall space to mount art. “This is leading us to put some thought into ‘flattened’, free-standing, plinth-mounted artworks, which are transparent or translucent so as not to block the light,” he says. Your favourite artwork will set the theme for the main saloon and draw the eye. “The central, core theme of any artwork on board would be on the focal wall in the saloon, and this should be a special piece, one that the owner would take with them one day when they leave the yacht,” says Sassoon. One of his favourites (above) is Leopold and Rudolf Blaschka, Octopus vulgaris, 2013 (© Guido Mocafico, courtesy Hamiltons Gallery, London). Steve Keeling, director of DKT Artworks, points out that there isn’t always wall space to mount art. “This is leading us to put some thought into ‘flattened’, free-standing, plinth-mounted artworks, which are transparent or translucent so as not to block the light,” he says. Polly Sturgess of RWD suggests comfortable and luxurious sofas to makes guests feel at home. The rustic Cornwall sofa collection from Finkeldei boasts deep seats and back cushions for extra comfort. Finkeldei also specialises in creating custom furnishings for new build yachts. 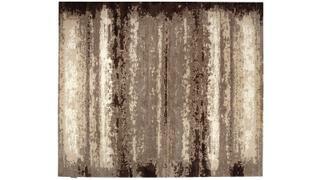 The saloon is a high-traffic area when entertaining, so select a rug that’s as resilient as it is good looking. The hand-tufted rugs from ICE Rugs’ IMO-certified superyacht collection (above) are made from high-quality wool that is strong, shiny and dirt repellent. The Domenico has a pattern that makes any stains or spills less obvious – perfect for a party. Polly Sturgess of RWD suggests comfortable and luxurious sofas to makes guests feel at home. The rustic Cornwall sofa collection from Finkeldei boasts deep seats and back cushions for extra comfort. Finkeldei also specialises in creating custom furnishings for new build yachts. The saloon is a high-traffic area when entertaining, so select a rug that’s as resilient as it is good looking. The hand-tufted rugs from ICE Rugs’ IMO-certified superyacht collection (above) are made from high-quality wool that is strong, shiny and dirt repellent. The Domenico has a pattern that makes any stains or spills less obvious – perfect for a party. Have a range of table settings ready for any occasion. 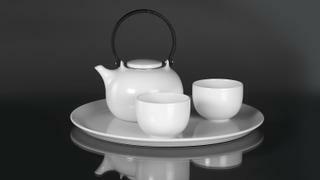 “We usually specify between three and five crockery ranges, from formal to casual,” says Sturgess. “Also, something for kids or plastic glasses for the hot tub.” Mixing and matching keeps your table looking fresh each time. Haviland offers a mix-and-match set, Infini Arc en Ciel, which updates its famed Infini collection in four bright, modern colours hand-applied on Limoges porcelain. “For a high-end looking table, silver cutlery is a must but for daily use choose an interesting stainless,” says de Cagny of Puiforcat. “Despite popular belief, sterling silver or plated silver can be put in the dishwasher, using a basic powder detergent that isn’t too harsh.” Vintage silverware, however, should be treated with extra TLC as the cement used in vintage knives can melt in hot water. 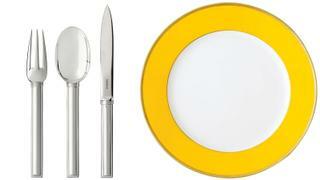 For an elegant table, select Puiforcat’s art deco-patterned Cannes silverware. In plated silver, the Normandie set was designed in the late 1920s by Jean Puiforcat and used on the famous French liner Normandie. Have a range of table settings ready for any occasion. “We usually specify between three and five crockery ranges, from formal to casual,” says Sturgess. “Also, something for kids or plastic glasses for the hot tub.” Mixing and matching keeps your table looking fresh each time. Haviland offers a mix-and-match set, Infini Arc en Ciel, which updates its famed Infini collection in four bright, modern colours hand-applied on Limoges porcelain. “For a high-end looking table, silver cutlery is a must but for daily use choose an interesting stainless,” says de Cagny of Puiforcat. “Despite popular belief, sterling silver or plated silver can be put in the dishwasher, using a basic powder detergent that isn’t too harsh.” Vintage silverware, however, should be treated with extra TLC as the cement used in vintage knives can melt in hot water. For an elegant table, select Puiforcat’s art deco-patterned Cannes silverware. In plated silver, the Normandie set was designed in the late 1920s by Jean Puiforcat and used on the famous French liner Normandie. “Consider a pillow menu for your guests to suit different tastes,” says Thomas Batty, of Glancy Fawcett. 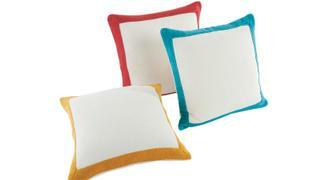 “Pillows that offer different support levels are good to accommodate a range of guests. You can get ones that have different fillings on each side or that come with extra filling for the crew to self-stuff. 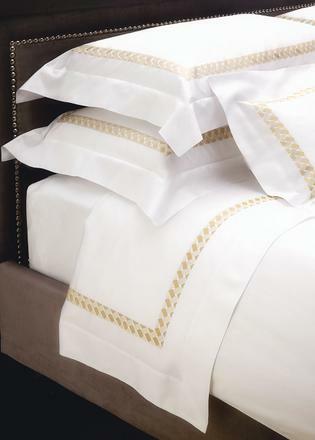 A hollowfibre option is also worth having for guests with allergies.” A mitre on the reverse of a pillowcase corner is considered a sign of good quality. “Outdoor living and entertaining is usually high on a yacht’s list of priorities, therefore awnings and umbrellas are essential in all outdoor areas to help protect from the sun, but also from night humidity and light rain,” says designer Cristiano Gatto. The Tuuci Ocean Master Classic umbrella (above) is manufactured to marine specifications and built to withstand harsh conditions. A nice touch is to provide a leather stand that holds multiple pairs of sunglasses – either in the beach club or a waterproof version on the sundeck. Glancy Fawcett stocks the Pinetti sunglasses rack. “Outdoor living and entertaining is usually high on a yacht’s list of priorities, therefore awnings and umbrellas are essential in all outdoor areas to help protect from the sun, but also from night humidity and light rain,” says designer Cristiano Gatto. The Tuuci Ocean Master Classic umbrella (above) is manufactured to marine specifications and built to withstand harsh conditions. A nice touch is to provide a leather stand that holds multiple pairs of sunglasses – either in the beach club or a waterproof version on the sundeck. Glancy Fawcett stocks the Pinetti sunglasses rack. “Outdoor furniture is subject to strong wind and salty air, so don’t use the same materials you’d use for a garden and choose something that’s weather resistant and agreeable to touch,” says Gatto. Glancy Fawcett recommends towel-covered cushions: Abyss & Habidecor’s Portofino cushions come with matching exterior towels, made from terrycloth, and can include a waterproof layer for beach use. “Outdoor furniture is subject to strong wind and salty air, so don’t use the same materials you’d use for a garden and choose something that’s weather resistant and agreeable to touch,” says Gatto. Glancy Fawcett recommends towel-covered cushions: Abyss & Habidecor’s Portofino cushions come with matching exterior towels, made from terrycloth, and can include a waterproof layer for beach use. “We’re being increasingly asked for flexibility of furniture, so rather than fitting a dining table to a deck, we are being asked for something that can be reduced in size, moved away for a party or movie night,” says Polly Sturgess of RWD. 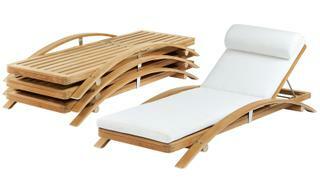 Foldable lounge chairs, such as Summit’s SD345 stacking adjustable chaise created by yacht designer John Munford, are ideal. “Lighting is extremely important when entertaining,” says Sturgess. “You want it to be soft, gentle and as atmospheric as possible. If you walk into a room with great lighting, you’ll want to stick around.” Choose a lighting system with dimmable lights so interior and exterior spaces can transform easily from relaxation to party. Superyacht cinemas are more popular than ever and are the perfect way to entertain guests of all ages. 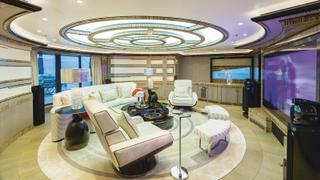 According to Videoworks, the ISA yacht Okto shines due to her upper deck cinema, while CRN’s Cloud 9 has an outdoor screen on the owner’s deck. When designing sound for superyacht entertaining, “the purpose of the area is key,” says Maurizio Minossi, Videoworks’ technical director. Sound must be carefully planned, he says, so it doesn’t affect other areas on board and one space can blend seamlessly into the other. “Lighting is extremely important when entertaining,” says Sturgess. “You want it to be soft, gentle and as atmospheric as possible. If you walk into a room with great lighting, you’ll want to stick around.” Choose a lighting system with dimmable lights so interior and exterior spaces can transform easily from relaxation to party. Superyacht cinemas are more popular than ever and are the perfect way to entertain guests of all ages. According to Videoworks, the ISA yacht Okto shines due to her upper deck cinema, while CRN’sCloud 9 has an outdoor screen on the owner’s deck. When designing sound for superyacht entertaining, “the purpose of the area is key,” says Maurizio Minossi, Videoworks’ technical director. Sound must be carefully planned, he says, so it doesn’t affect other areas on board and one space can blend seamlessly into the other.